The growth of the Internet has led to a facet of marketing known as “inbound marketing”. This refers to activities that draw customers in by providing interesting and targeted content, rather than using methods like paid advertisements and mailing lists to reach out to customers, often casting a very wide net. Today, inbound marketing is one of the most popular, efficient, and effective ways businesses attract customers online, as it focuses on creating great content that attracts interested users and slowly converts them to loyal followers, qualified leads, and returning customers. Build content for people and search engines – provide strong and focused content such as product/solution info, blog posts on topics pertaining to your target audience(s), links to external mentions of your business (i.e., for a restaurant, a good review appearing in a local magazine), social media posts, videos, and more. This will help search engines rank your site so people can locate it, find it useful and return. Enable action – your website should have clear calls to action that make it simple and desirable for users to get more involved and learn more about what you do. Actions can be joining your email list, sharing content, contacting you directly, following you on social media, visiting your store, etc. Monitor progress – users who follow your calls to action will continue to receive and enjoy your content, and their positive experiences will quite often inspire them to share. You can track these users to keep them engaged and see if they’re potential leads. On the other hand, you can learn which pages on your website are the least effective. Continually evolve – inbound marketing doesn’t have an end-point. The nature of it is to dive in, try different things, see what works and adjust accordingly. In the beginning, you use content to attract lots of potential customers. Some of these will go on to be frequent site visitors, and then possibly customers, and then promoters who will share your content. This will attract more potential customers, which will set the funnel in motion all over again. 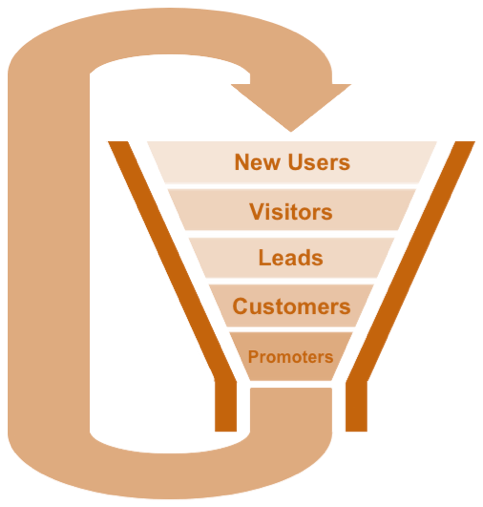 This cyclical process is part of what makes inbound marketing so effective in online marketing today.